Seeing a group of fish swimming in unison is probably the dream of all choreographs. It looks so perfect! How is this achievement possible? First, it is important to understand the difference between a shoal and school of fish. Sometimes people don't really know what is the distinction. This two terms are routinely used in marine life books and in bio-conversation media, and both of them are used to define a behaviour of a group of fish. A group of fish staying together is called shoal when its purpose is to avoid being eaten by a bigger predator. A shoal is a group of individuals congregating together to benefit from "safety in numbers" but not moving or behaving in unison. The reason they stay in a group can be as well for social reasons: meet a female or a male partner, or to find food. They prefer to find a healthy shoal of fish, with mates from the same specie, or same colour and size. 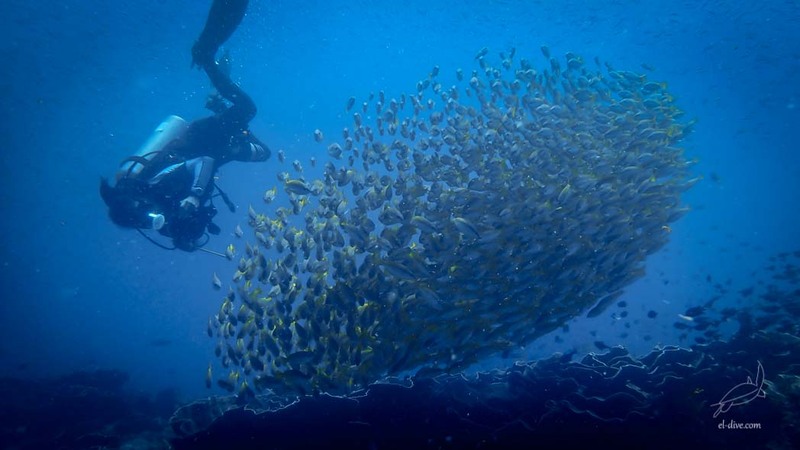 If the shoal acts in unison, then it becomes a school of fish. Acting in unison means: Changing direction at the same time, staying close to each other and heading on the same direction. A school is an organised shoal of fish. Big schools make often the predators confused, because those cannot be focused on one prey only. Even sometimes, the predators themselves become afraid. How the fish swim in unison ? Schools of fish move very fast and change direction in an instant neither breaking the formation nor hitting each other. The speed of reaction allows them to copy their neighbours at the same time, which they can see from both sides. The vision is a very important requirement for the school to be able to survive. However, many species of fish have a lateral line on their body that contains similar cells from the ciliated ones of our internal ear. These specific cells allow the fish to detect changes in the ocean currents and in the movements of close individuals when the visibility underwater is low. Therefore, they can keep a safe distance to each other whenever they change speed or direction. That is how fish make a nice and smooth formation. Swimming in groups low down the stress. In fact, the heart beat rate of a solitary fish is often higher than the one of a fish in a school. Schools moving very quickly have generally a shape with edges. Schools eating or moving slowly have more a round shape. In all configurations, people love them, not only the choreographs. There is something hypnotizing about groups of fish. The behaviours are interesting to observe, and colourful fish make the moment more magical. You can take a look at our photo gallery.